We all know that currently we are going crazy over the movie which was recently released in cinema's, the Marvel's Avengers : Age of Ultron. 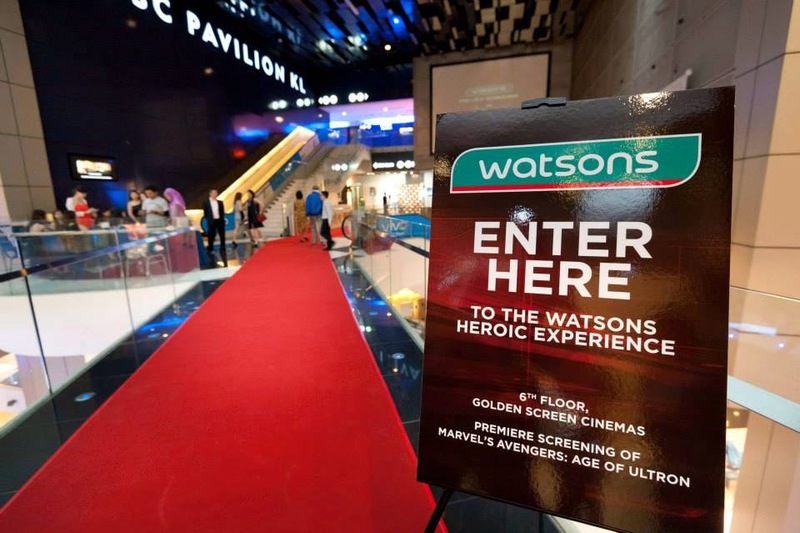 In conjunction with Watsons Malaysia, one of the leading retail brand in Malaysia, had recently held a special screening of Marvel 's Avengers: Age of Ultron with their partners of the media, suppliers and also Watsons VIP members to attend the grand launch of their latest campaign, The Watsons Heroic, which included a special screening of the movie. Truly honoured that they invited me to catch the block buster movie and being one of the first few to watch Marvel 's Avengers: Age of Ultron. Moving on, if you have watched Marvel 's Avengers: Age of Ultron, don't you think the movie was amazing?! and if you haven't, you have to get your *arse* down to the cinema's pronto! And of course, you must be wondering, what does the movie has to do with Watsons? Well, read more to find out! Not only that Watsons is having their seasonal sales but they're offering more promotions for their loyal customers. 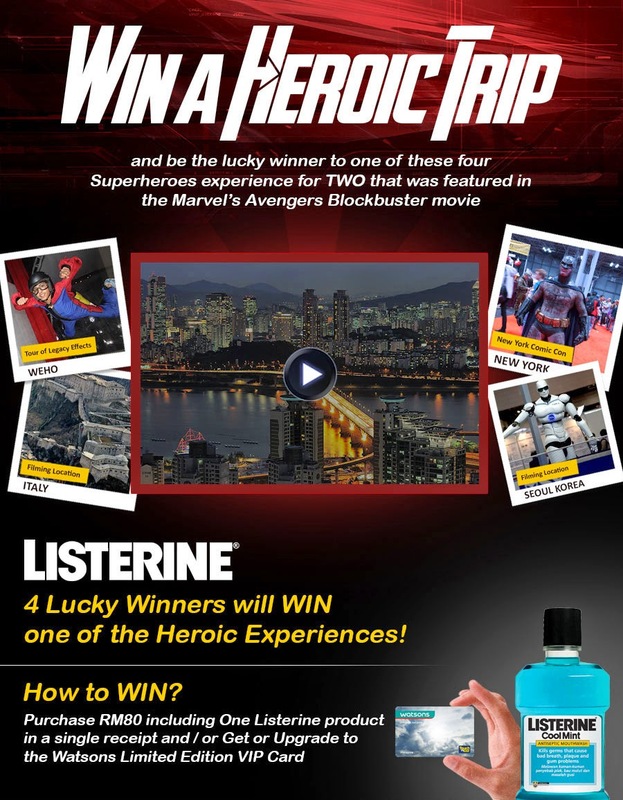 Watsons stores will be having their latest campaign called The Watsons Heroic starting from the 23rd of April 2015 until the 20th May 2015. Which pretty much is around a month in duration. So this is where Watsons offers customers and VIP card members fantastic offers and money-cant buy experiences. One of it would be where shoppers can meet the Marvel's Avengers characters in selected stores and also take pictures with the 3D art floor stickers. 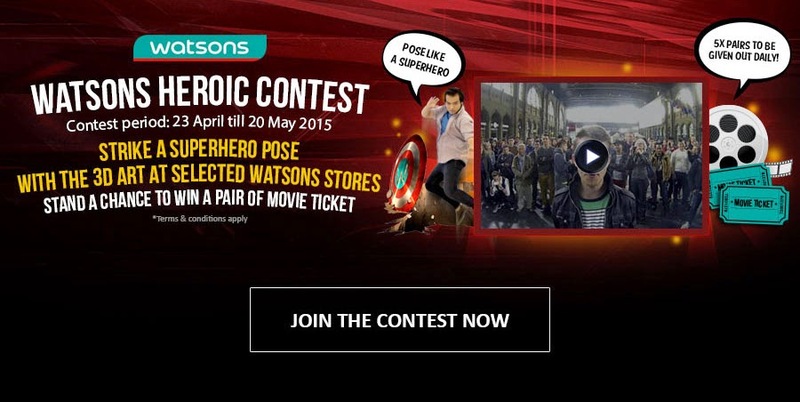 Its pretty simple to win merchandises from Watsons, as all you need to do would be to hashtag #watsonsheroic. 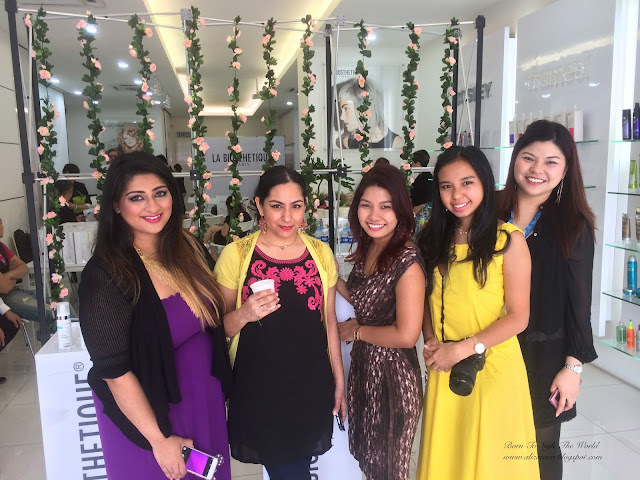 Theres a microsite, www.watsonsheroic.com, which has been set up for customers to check out all the exciting activities organised by Watsons. Watsons has also launched the Limited Edition Watsons VIP card that fans can personalise with Marvel's Avengers sticker's.This Limited Edition Watsons VIP Card can be purchased at any Watsons stores or Online Stores at only RM20 for a new sign up and upgrade. 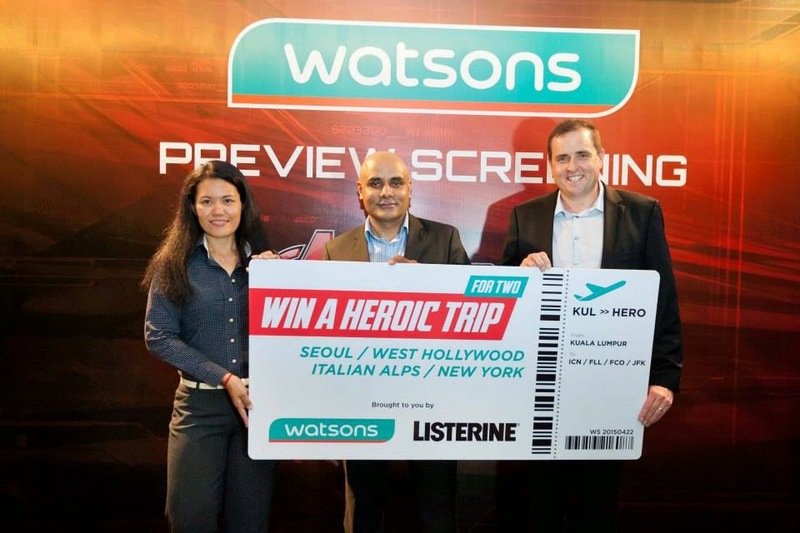 And to make their official Heroic launch more exciting, they will be giving away 4 pairs of Heroic trips which was featured in the blockbuster movie, which of course, would be to Seoul, West Hollywood, Italian Alps and New York City when customers sign up or upgrade to the limited edition Watsons VIP Cards. Or if you would want to work around the upgrade fee, you can shop at Watsons and spend above an amount of RM80 (inclusive of 1 Listerine item) to get an upgrade. Winner will not only get a free trip to these amazing locations, but also be able to attend the world famous Comic Con in New york, which if you're not aware off, are already sold out months ago. Watsons will be planning more exciting innovative campaigns, so do keep updated with Watsons Malaysia to make sure you don't miss out on all the fun. 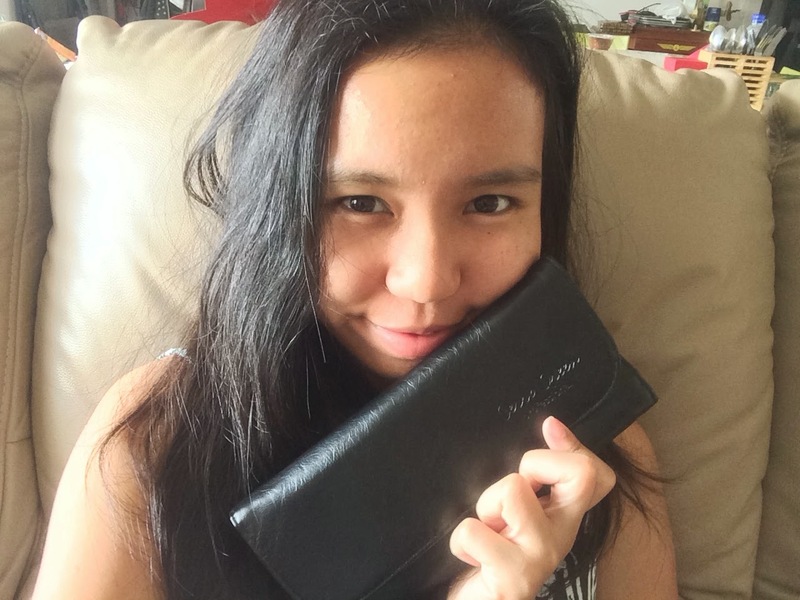 And of course, how can i not attend to watch Marvel's Avengers : Age of Ultron, without my loyal partner in crime? Well, if you're here to read about the whole plot of Marvel's Avengers : Age of Ultron, i aint gonna spoilt it for you. But its a must watch! Cause the movie actually gave me chills, and I'm already looking forward to the next sequel. So, thats all for now. Don't forget to visit Watsons stores to keep updated with their promotions and also don't forget to get the Limited Edition Touch and go card by Watsons. You're going to definitely miss out on all the fun and you wouldn't want that to happen. For more information, head on over to Watsons Event page by clicking here, or visit their Facebook by clicking here. 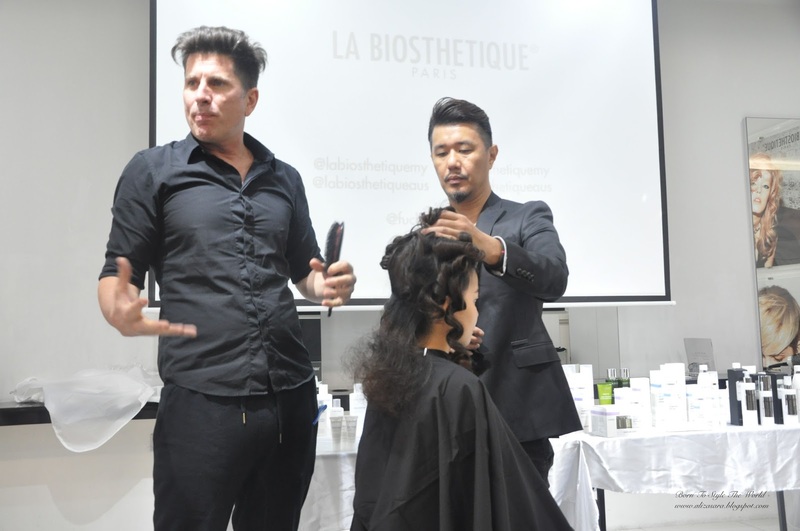 I was honoured to be a part of the La Biosthetique Paris Press Launch, so thank you La Biosthetique Paris and team for having me to the very informative launch on La Biosthetique Paris. So what is La Biosthetique Paris? 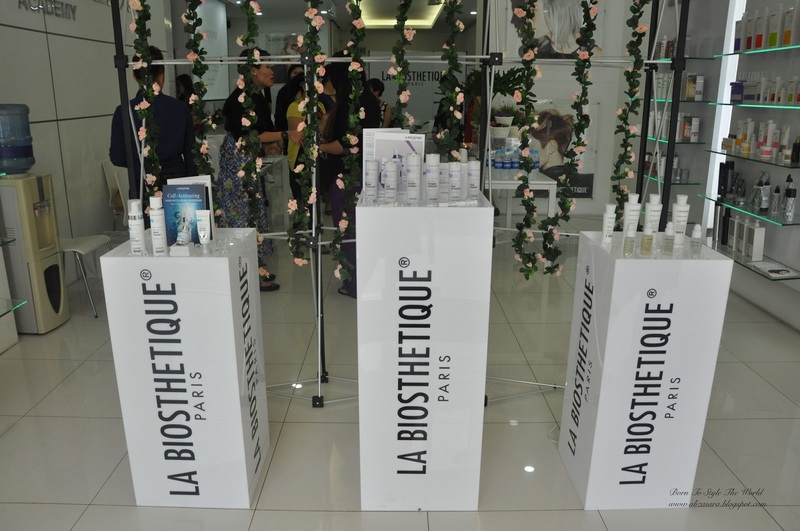 La Biosthetique comes from Paris, and from what was witnessed at the launch was that the brand has one of the most detailed hair-care products out there in the market. 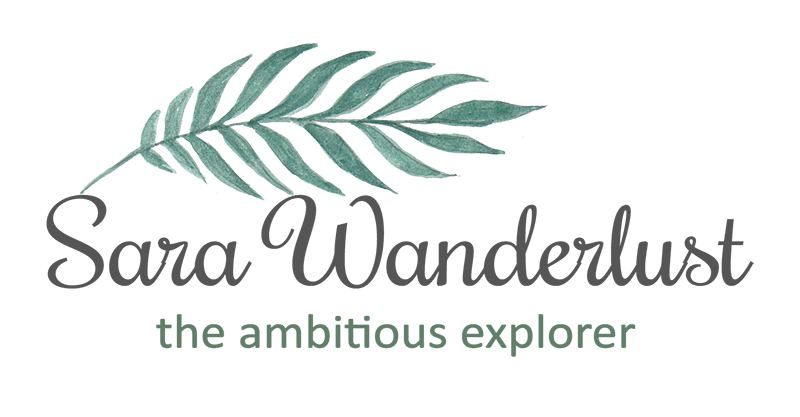 The origins of the brand is that it began as a laboratory that took pride in fixing hair problems by only using natural curated products which sums back to traditional beliefs of getting herbs to work its magic. It started within the Black Forest in Germany, surrounded by nature of course, in the year 1947. 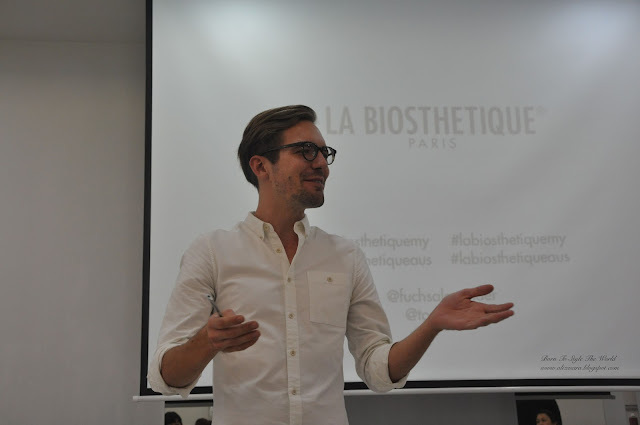 We had Alexander as the La Biosthetique representative. And if you don't get what i meant about detailed hair-care products, well, they have actually took a consideration into including products for babies, called "Babybios" scented with Lavender and Chamomile which resolves the issue of cradle cap by helping weak keratin structure and ineffective gland activities. 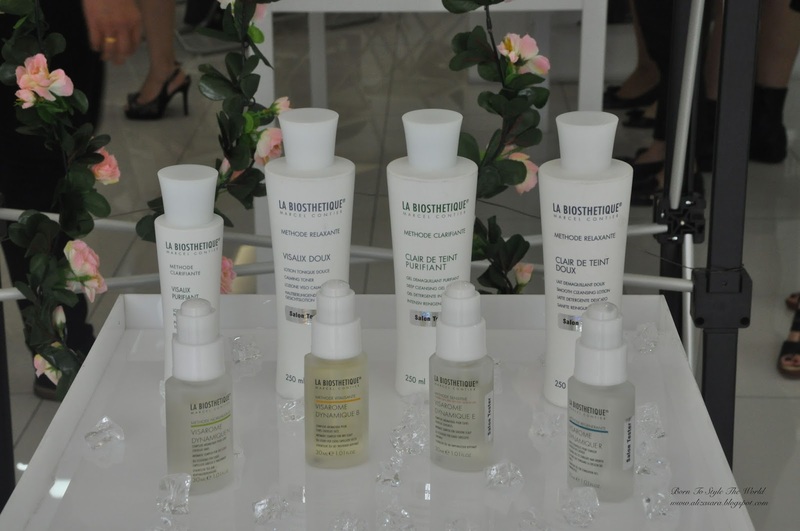 Back int he 1950's, it used to be an issue which thanks to La Biosthetique Paris, helped a lot o kids out there which resulted to became a developing product that has an ideal to describe beauty. Do you even see what i mean? Thats not even all! 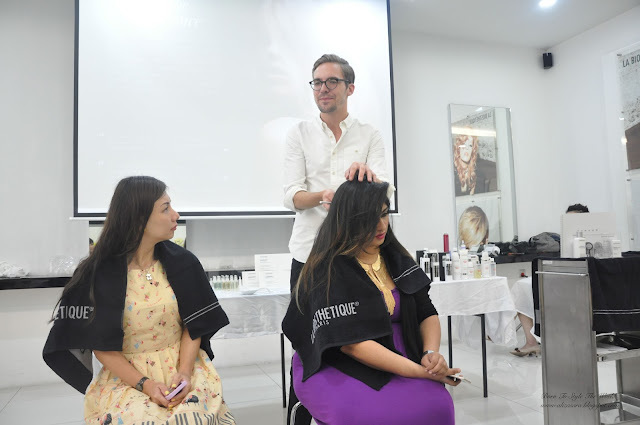 There have more than you can imagine to specialised to your hair care needs, which i think they have really put some thought into getting the right treatment that your hair needs. 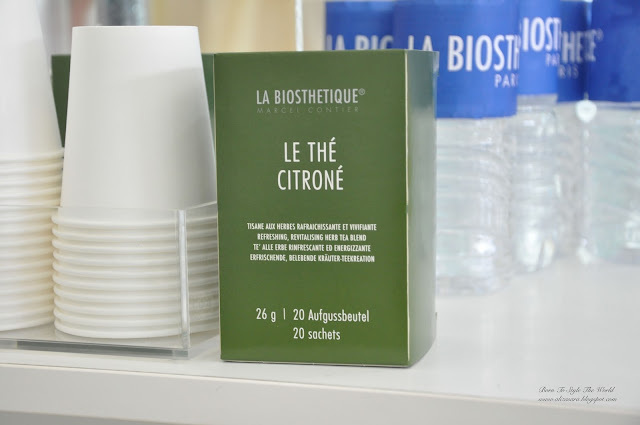 La Biosthetique Paris has personalised every experience for every customers from the environment to the whole treatment process which does not require to be attached to the brand as Alexander has mentioned if you have used it for too long, it might not have any effect after a while. 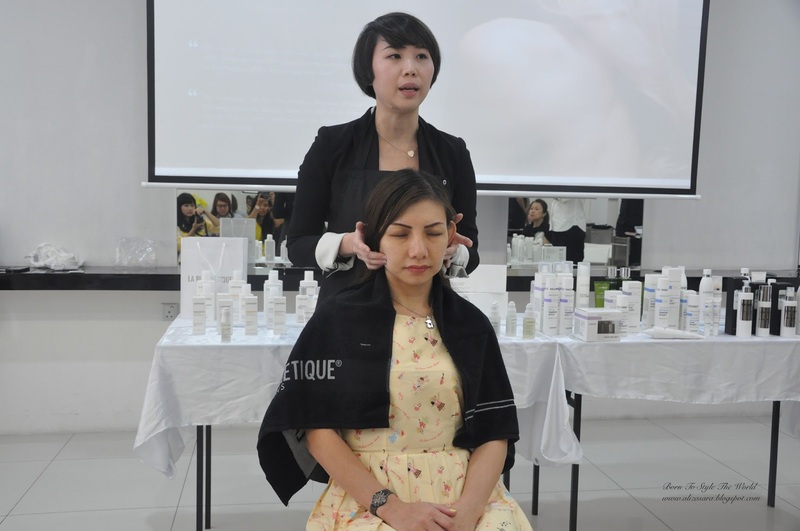 A demonstration on the results before and after was done by using La Biosthetique. Alexander has mentioned that scalp care is top priority at La Biosthetique, and of course with top priority there is actually a special scalp test kit that helps hair care professionals to determine whatever issues the customer has before recommending a specific range. 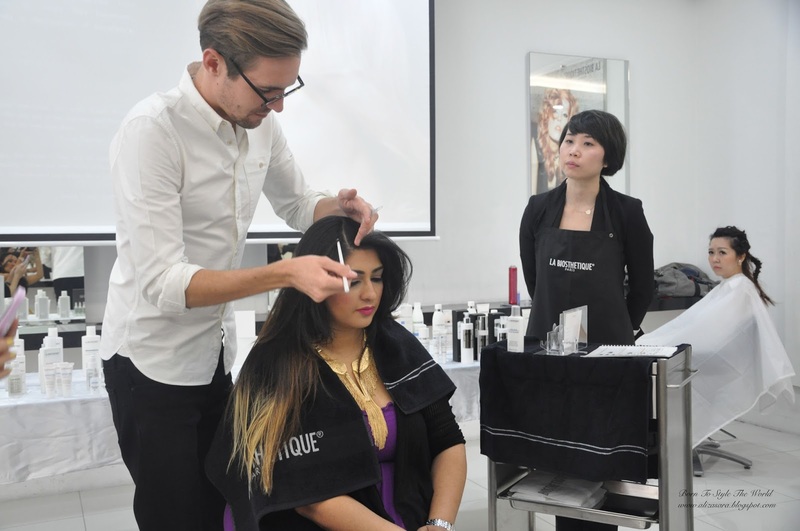 At at the end of the scalp test kit, it also instantly diagnose the pH balance, dandruff and sebum levels on the hair. Did you know that from a ge 25 onwards, your hair quality will slowly start losing its natural elasticity? I think as a customer myself, it is a question why we can't find these brands available at pharmacies? Well, the reason to that is because they prefer having hair care specialist to go through your hair and determine which hair-care product suits you best. Definitely not mass produced to be bought by everyone because its specialised to serve the suited needs of each customer. Also not to forget the special treatment of a head massage with every La Bisothetique treatment which will be given to you before the treatment start to relax your mood, and roots. A hair up-do demonstration was also given by Director of Vogue Nationale, Todd Arndt. 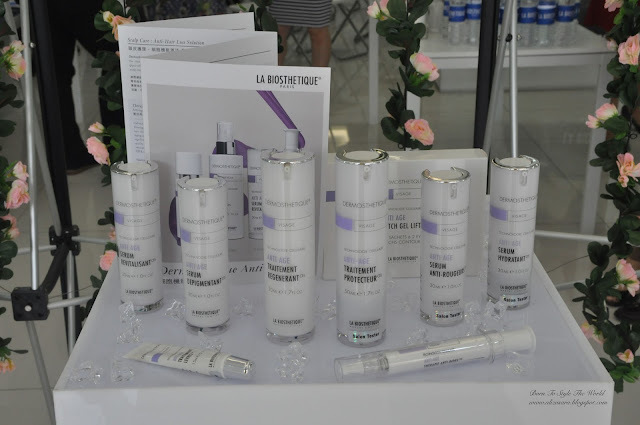 So i think it can be said that La Biosthetique is specially catered to those who want to solve issues with their hair. With such a wide range in their collection, it can be said that its does its job into fixing your issues from hair fall, to dandruff to even the quality of every strand on your hair. Their special organic tea to relax you before every treatment. 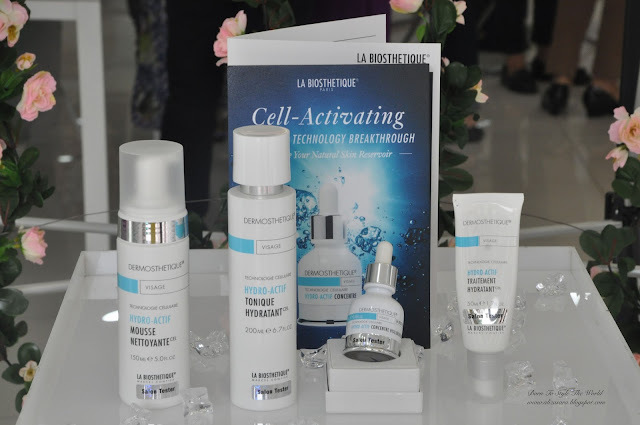 The wide range of La Biosthetique. If you would like to know more about La Biosthetique, do head over their Official Facebook Page and Official Website. And you'll know what i mean when i say specialised. 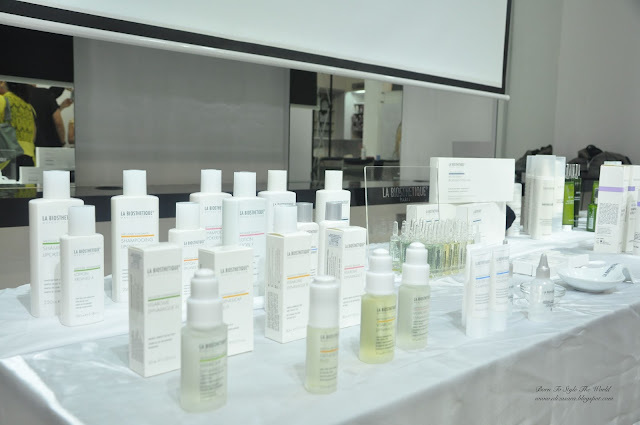 In Malaysia, their products are only available in certain salons, which i have listed below. I'll be getting my scalp treatment done soon and i can't wait to tell you all about it ! This goes out to to you Japanese cuisine lovers. And of course, we all know when it comes to Japanese cuisine, its always priced at a higher end in Malaysia. But fret not, cause i've discovered somewhere more affordable to enjoy Japanese cuisine at a lower casual cost, with superb quality assured too! Introducing, Yuzen Japanese Restaurant. Thanks to Food-ink and also Machi, the owner of Yuzen, for giving me the opportunity to tryout their amazing menu options. And don't get me started about the food. Yums. Well, one of the highlights of the Restaurant would be that they provide "O-makase" which means "I'll leave it to you" or in a more general term, Chefs special. If you're afraid of the price, well, you don't have to worry! They provide o-makase based on your budget, or you can just ask the owner of the restaurant, for recommendations as he's usually around the restaurant always making new friends with customers. What makes Yuzen, a one of a kind restaurant in Malaysia would be that they actually import their sashimi, fresh from Japan daily! How amazing is that? No wonder the food taste so good! And through the photos that i've attached above, you can clearly see how fresh it is. After eating sashimi at Yuzen, it would be a challenge to go to other Japanese Franchise in Malaysia as i find that this was one of the best i've had! One of the closest Restaurants to authentic Japan cuisine. Next on the appetisers list would be the "Tuna Tataki Avocado" which is similar to the "Salmon Ikura Tataki" where the outer layer is cooked with a raw centre. The dressing was with Japanse Soy sauce with a touch of the famous Japanese Soy Sauce. Not to forget the presentation of it was superb. Can you tell that they put a lot of effort to present it as if you're paying for fine dining? This, THIS, was delicious! As you can see in the photo, they were generous enough to arrange the Chawan Mushi with the fillings on the outer part to show me the ingredient of the Chawan Mushi. After having my Chawan Mushi here, i don't think any other Chawan Mushi would be the same. This was irresistible! One of the best, and at a price of RM10?! This is a MUST order when you visit. This was my favourite among everything else. The Salmon Teriyaki was nicely done! This is what i call a perfect Teriyaki Salmon, where it wasn't overcooked, which is usually a common mistake done when cooking salmon, and also, the Teriyaki was the highlight. The mashed potatoes compliments the Salmon which balances the taste perfectly! This is basically sliced squid grilled in Teriyaki sauce and according to the owner of Yuzen, the highlight of this dish would be the dip for the squid. He suggested to try just the squid on my first bite, followed by my second bite adding the squid into the dip. The dipping sauce had a slight taste of soy sauce and chicken liver, which was a pleasant taste even though I'm not a fan of chicken liver. This was definitely an exception! And to end the day, this was the last dish served. Chicken Katsu basically means Japanese Fried Chicken and what makes this dish unique was the yam sauce topped on the Chicken Katsu. The Yam isn't our usual yam and its imported all the way from Japan. We were suggested to mix the sauce and the chicken before consuming it and the yam texture was similar to raw egg yolk, but its not egg. This is highly recommended if you have never tried Japanese Yam. The owner was kind enough to show me what the Japanese Yam looked like, and below would be the photo of the Japanese Yam. If you ask me, its pretty large than our usual Yams. Fun fact: This particular yam has a certain way to handle it as the outer layer or the skin can cause rashes when in contact with skin. yikes! But the benefits of consuming this are priceless. Very good for your body and in numerous research studies, it has been used in a variety of Asian medicinal disciplines for centuries to heal diabetes, diarrhoea, asthma, dry cough and frequent urination. Well, to end my post here would be an image of this really cute souvenir done by Stella, the founder of Food-Ink which i find super duper adorable and creative! Thank you for this really cute sushi Stella. Also, i might be heading back there again soon to try other dishes with my family. If you have any questions to ask, do not hesitate to leave a comment below. Before i forget, they also provide special private rooms too for private dining! 2 rooms for 8 people, which can also be a room for 16 and also 2 rooms for 2 people, to enjoy a more intimate dining session with NO EXTRA CHARGES. Also, a hint by the owner, if you're planning to bring your special partner on a date, fret not as they will truly maximise the occasion for you for extra special service to make sure you and your partner would enjoy your dining experience at Yuzen. Here's a video by Food-Inks on Yuzen Japanese Restaurant. In an overall, i would really recommend Japanese cuisine lovers to drop by Yuzen to enjoy Japanese cuisine. I would personally give 4.5 stars out of 5. So what are you waiting for? Why pay more to enjoy Japanese food. I have rest my case. Do also check out their Facebook for more information, or head on over to Foodink for more details on Yuzen Japanese Restaurant. Well, i hope you found this interesting. Till then! Hey, so I'm pretty sure why you're here. 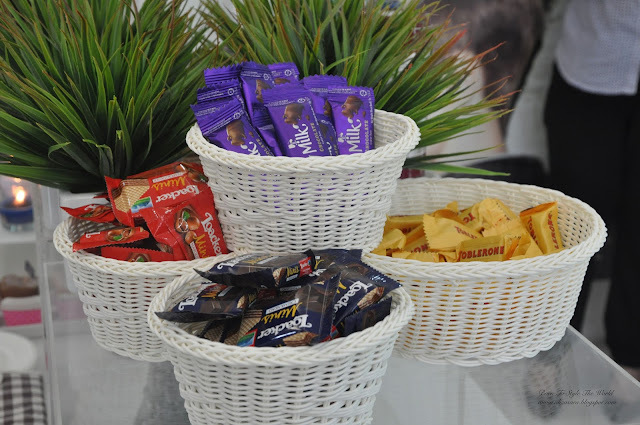 Its because we're Malaysians, and lets not deny the fact that we love free Goodie Bags! So let me spill the details for you or if you're wondering whats in the bag. I've collected mine from Tesco Puchong, last Friday, and to your convenience, I'm pretty sure you would want to know what you'll be getting in your goodie bag? Well well, you will find out how at the end of this post. Everything is pretty much explained in the post above and as stated in the conditions, you will receive one bag for each copy purchased. So yes, you can also buy some copies for you friend too and get a goodie bag for them as they don't limit a goodie bag to per person. But better be there early as the promotion only runs till stocks last. 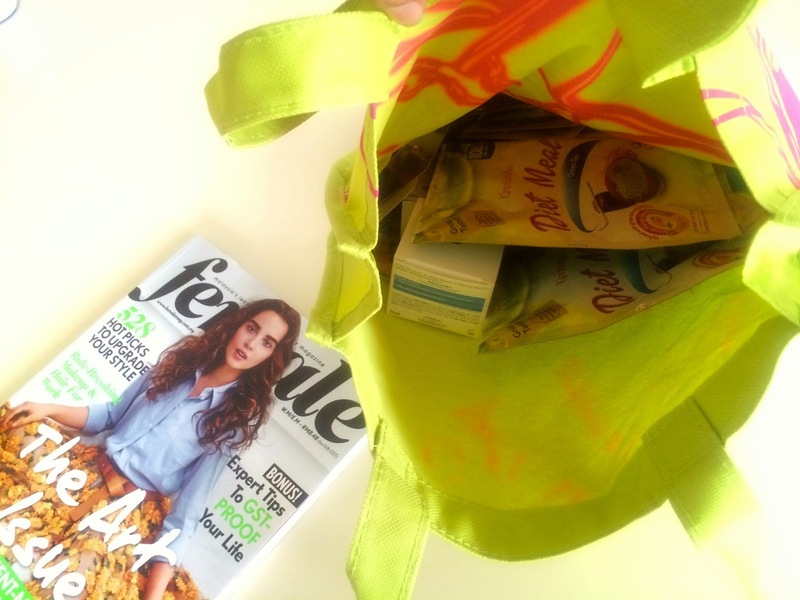 And of course, whats in my goodie bag? Please mind me spamming with photos. I got myself a Female magazine for RM8.48 (including 6% GST) and also a Goodie Bag worth up to RM60! Total steal promotion, so thank you BluInc for doing this! Psst, the next one would be this coming Friday, 17th April 2015, at Tesco Mutiara between 11am till 2pm. Better plan your lunch time on Friday if you want to get your hands on this! Till then, i wish you all the best of luck. 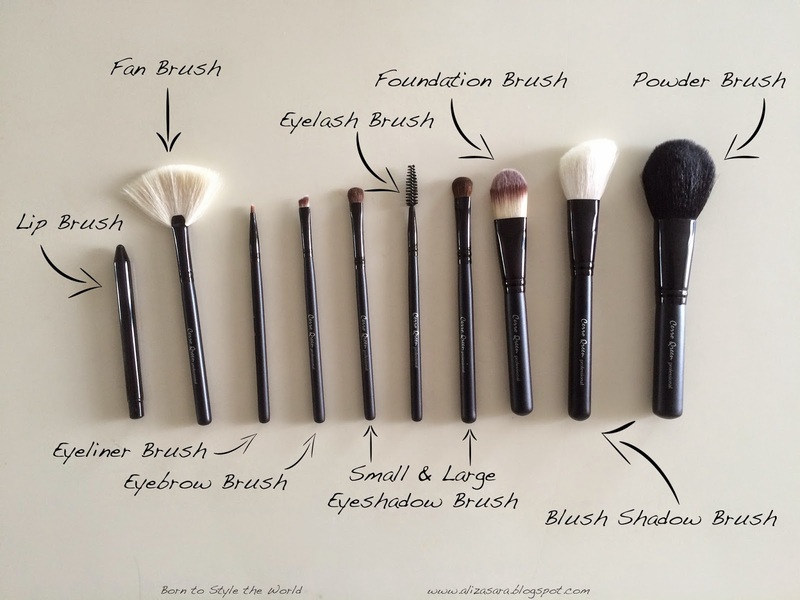 So, heres where i got my brushes from. 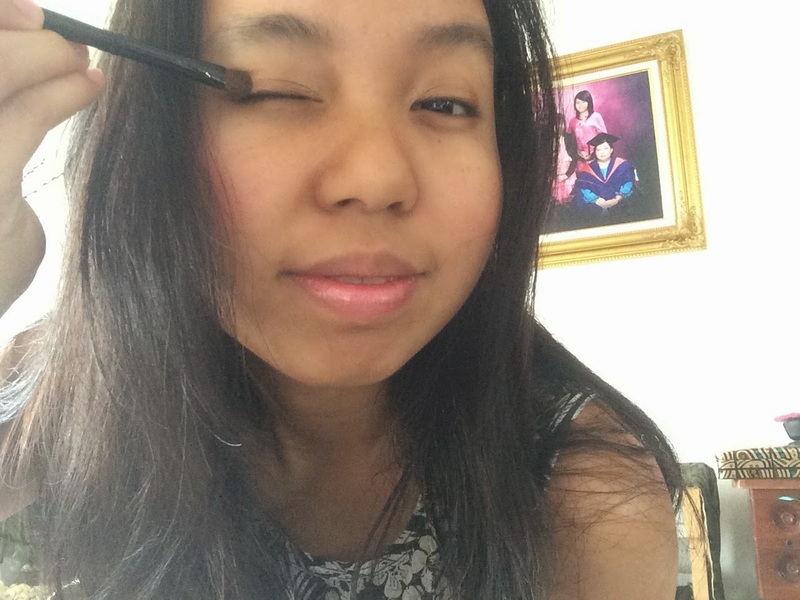 Its from a site called Natta Cosme where they provide numerous beauty products that brings out the true physical beauty of the people, or at least, thats what it says on their site. 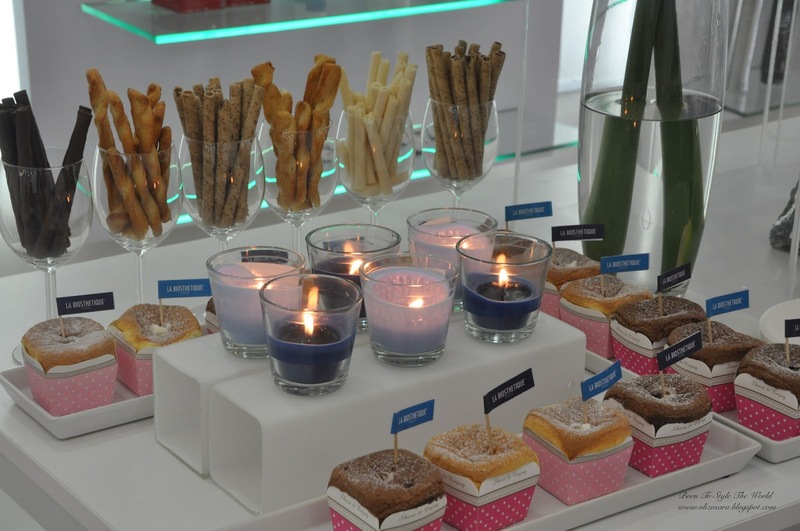 The products would have a variety of skin care, body wash and of course, make up sets! 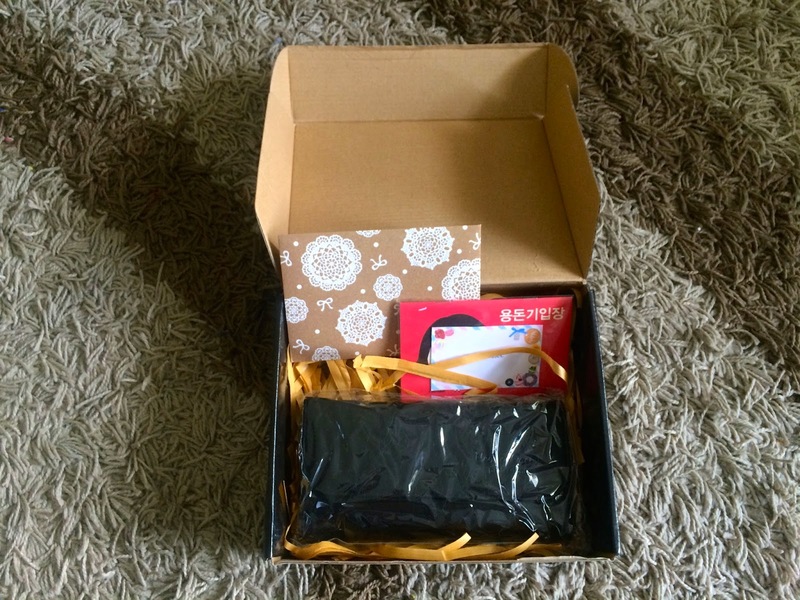 When i received my parcel, it was all wrapped in a box by Natta Cosme to ensure that your products are well kept to prevent from damage during postage. And i also love how efficient their courier service is cause i didn't need to wait that long to receive it right in front of my door step. Below would be a photo of the box and a photo when i first opened the box. Not that its efficient, but the collection that they have is pretty irresistible i must say. 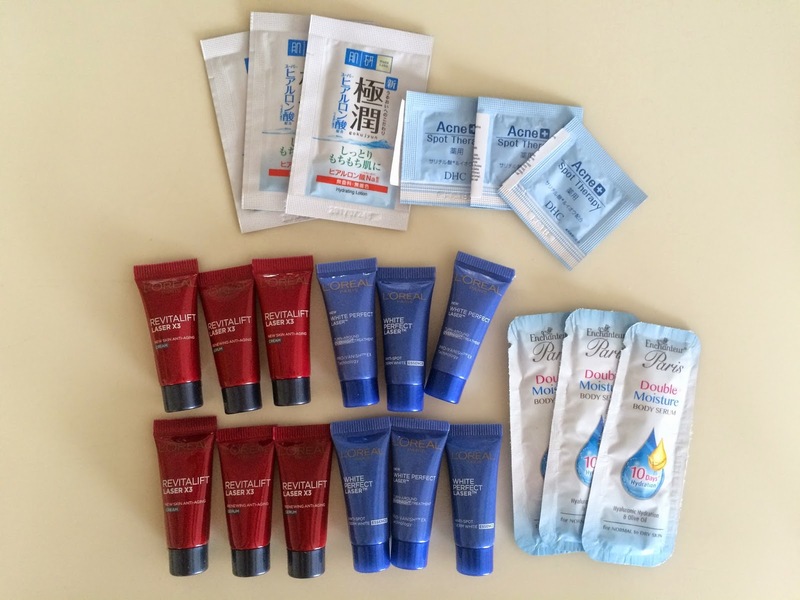 You can get beauty products from a variety of countries such as Japan, Taiwan, Korea, America and etc. Which is good as its pretty hard for us to get good quality beauty products here in Malaysia. Boohoo. 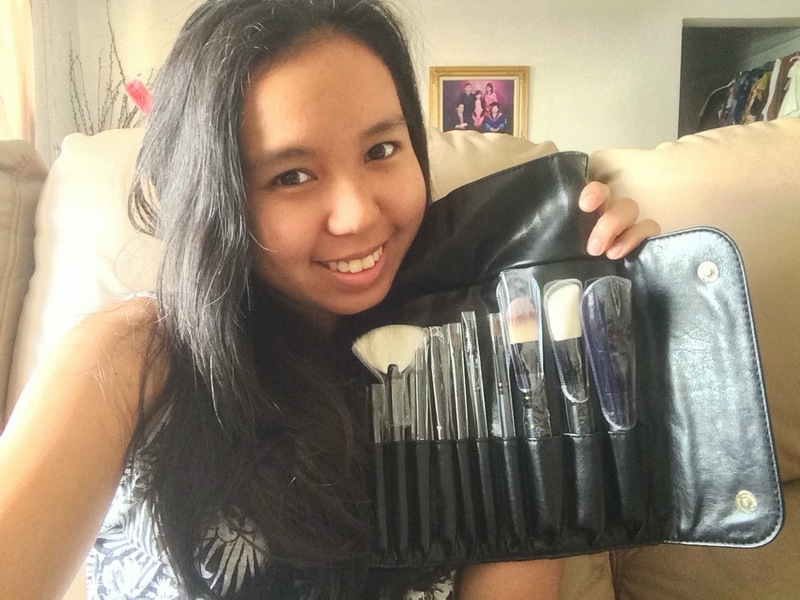 So, here's what i got, a Cerro Qreen Fashion Makeup Brush Set (Natural Animal Wool) - Black in 10 Pieces. I love the fact that it comes in a soft PU leather pouch so that all my brushes are kept organised and not everywhere on my dressing table. And also, its convenient when I'm bringing it out to my wanderlust trips as everything i need would all be in this pouch, ready-to-go. Also, for today, i wanted to try a natural look cause i didn't want to look too glamorous on a weekend. lol. And yes, its a lazy weekend ahead for me. Here's a clearer photo what the brushes look like, aren't they awesome. 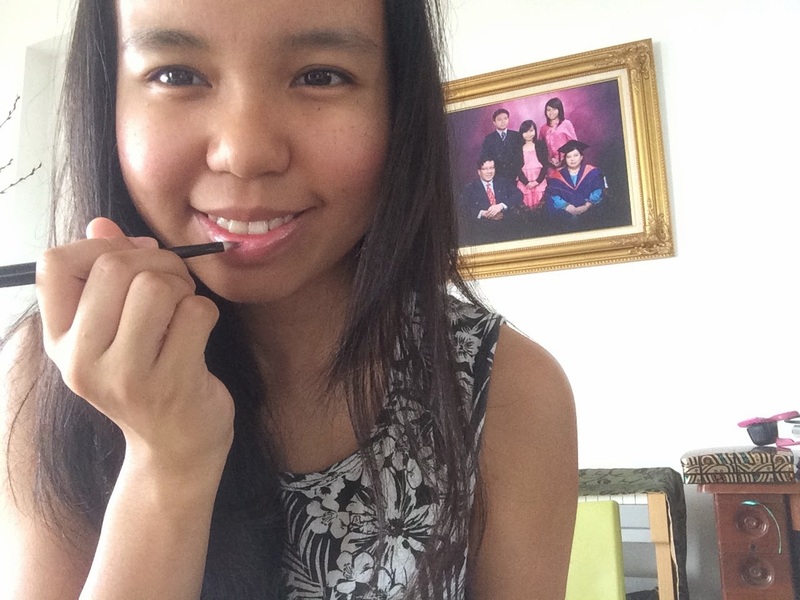 So, for my natural look, i've decided to tryout the powder brush, the blusher shadow brush, the lip brush and the small eyeshadow brush. 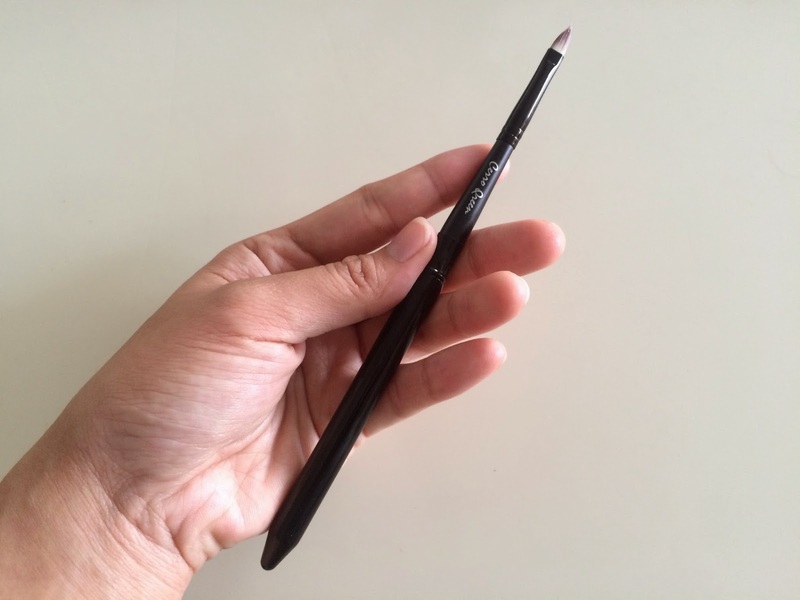 First off, lets start with the Powder brush I love the length of the brush and the handle is easy to hold on to. 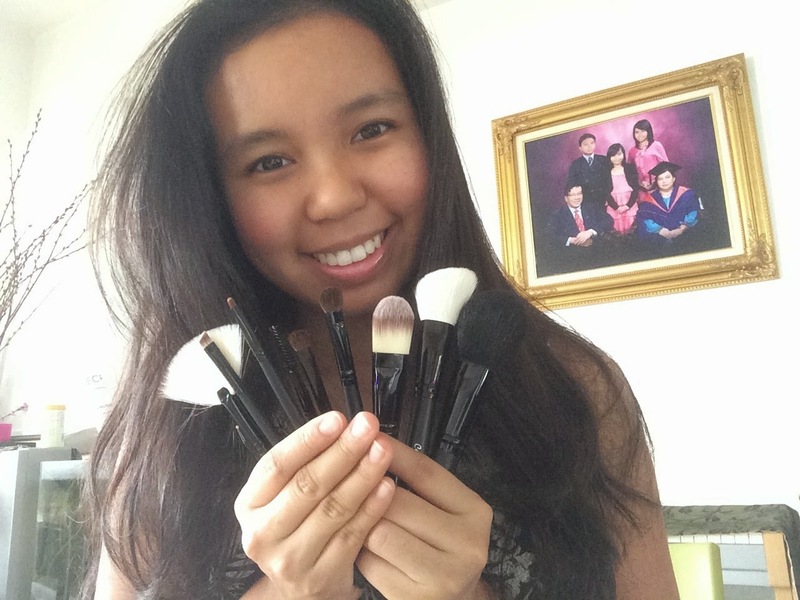 The brush is made out of goats hair and its really good at picking the right amount of powder on the brush. You can refer to the photo below of how good it grabs hold of the powder which isn't to dense. This helps apply sufficient amount of powder on your face instead of looking like you have a thick layer of powder on your face. 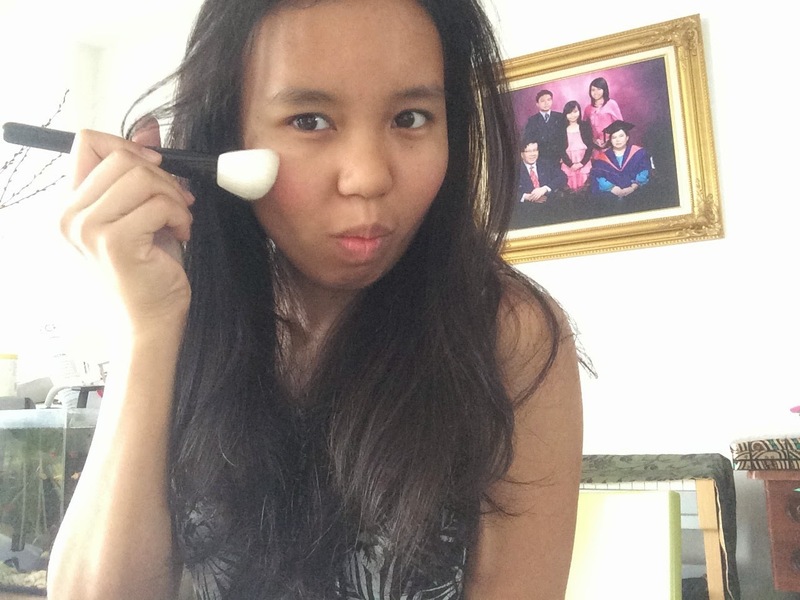 Next would be, the blusher shadow. 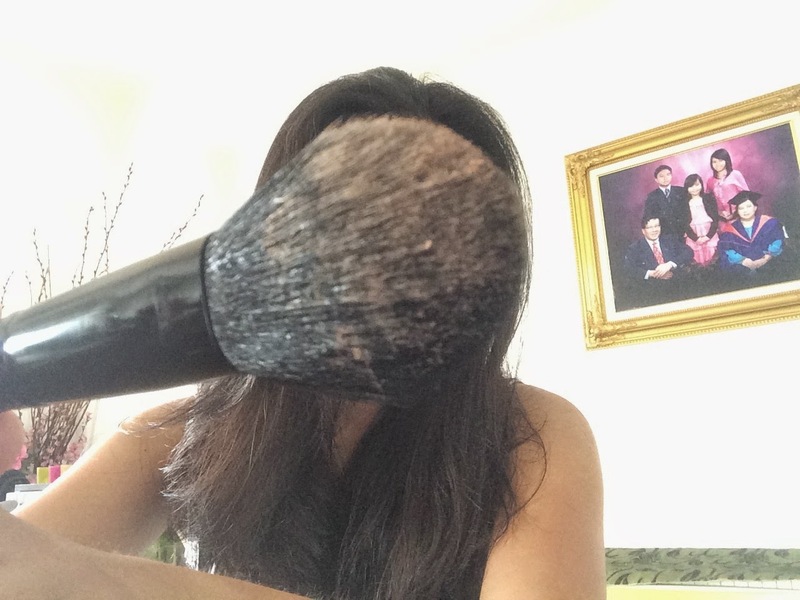 I love the texture of it, similar to the powder brush, it has a good flat surface so that when you apply your blusher or if your doing contouring, it would be easy to make sure that the application is smooth on the surface of your skin. Well, in an overall view, i love the whole collection of Cerro Qreen as quality is assured and proven too *wink. 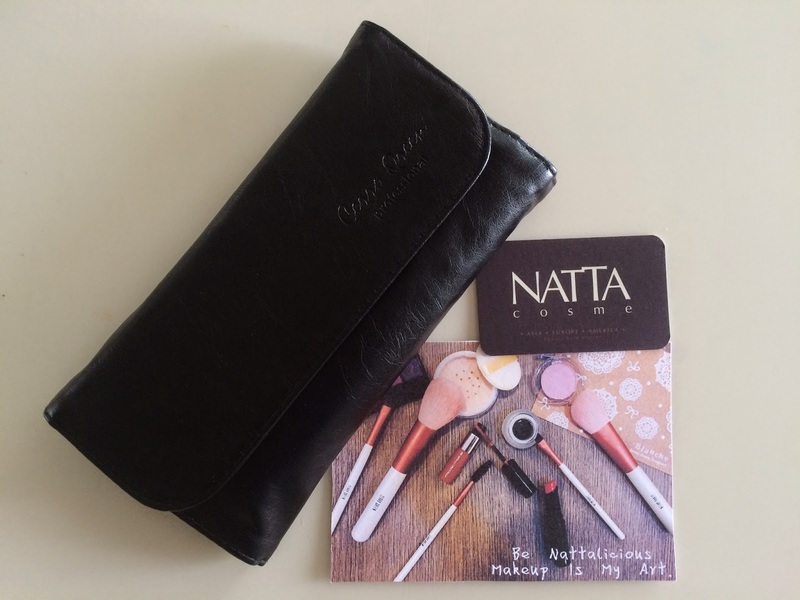 So if you're looking for affordable make up brushes in a set, do not forget to check out Natta Cosme to get these amazing brushes with additional discounts. The original price for "Cerro Qreen Fashion Makeup Brush Set (Natural Animal Wool) - Black in 10 Pieces" would be RM75.90 but currently on sale on the website for RM60.72! That is crazy! 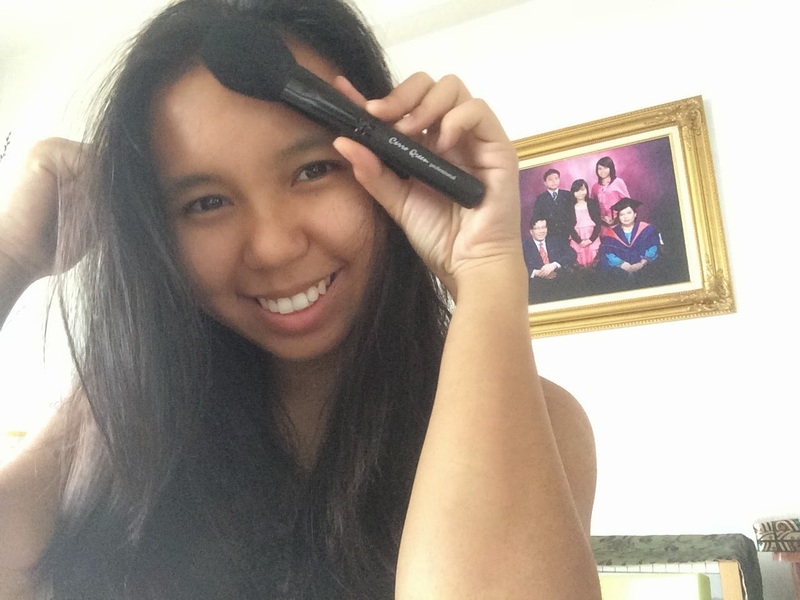 which means its less than RM10 per brush. For more information, do not hesitate to check out Natta Cosme, where i got my brushes from, by clicking here OR their Facebook by clicking here. 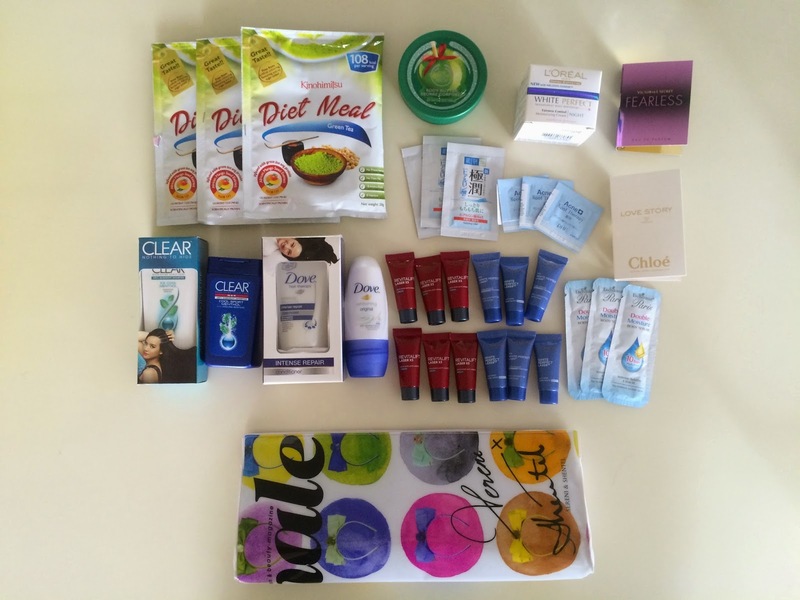 They have tons of reasonable priced beauty products with tons of variety to choose from. So what are you waiting for? Do check out Natta Cosme now before your favourites are marked as SOLD OUT. Do not hesitate to ask me any question on the product by clicking the comment button below. Hope you found this helpful. Signing out.